AmericanMuscle.com and Muscle Mustangs & Fast Fords magazine have teamed up for a new competition called Dyno Wars, pitting the most powerful Mustangs in the country against one another to see who makes the most horsepower. The rules are simple – “Run whatcha brung, and hope you brung enough!” Four of the events will be held throughout the country this year, the most recent happening a few weeks back at the American Muscle headquarters in Malvern, PA. 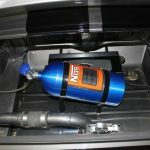 The results are certainly impressive, with only one Mustang making less than 700 rwhp and the most powerful car – a turbocharged 2011 Mustang GT built by JPC Racing – netting over 900 rwhp. Combined the six Mustangs produced a total of nearly 5,000 horsepower. This entry was written by by Novocaine (Ford Mustang) and posted here on Thursday, April 26th, 2012 at 3:31 pm and is filed under Reviews, Videos. This article was not written by us, rather gathered using RSS feeds listed here. We take no credit for this article. You can leave a response, or trackback from your own site.